Here at the Gynocratic Art Gallery we revere all things handmade. And now, you can knit your own GAG banner, or turn it into a sweater, or studio blanket, or signage for your next pop-up exhibition! 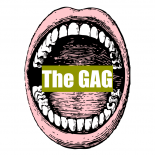 Be sure to share a photo of you with your handmade GAG on Facebook when your done. We can’t wait to see it! Sarah Jones of ArtsLink NB, at VISIONS 2025 with the Sheila Hugh MacKay Foundation.